My thoughts !! | எனது எண்ணங்கள் !! : Lost Railway Station of Rameswaram Road (Puthu Road). A Metre Gauge station. Lost Railway Station of Rameswaram Road (Puthu Road). A Metre Gauge station. Recently I had a privilege to travel to Pamban Island. Although I had travelled couple of times and visited same place, only this time I had an opportunity to gather data on erstwhile railway line that ran from Pamban Junction to Danushkodi Pier which was in turn connected by a ferry till Thalaimannar in Sri Lanka for onward connections to Colombo and other towns in that country. This steamer service was terminated in 1984 after attacks by Liberation tigers of Tamil Eelam or LTTE as they were known. Post 1964 the service originated and terminated in Rameswaram fishing harbour. The remains of the rail line from Pamban, can be seen just after Rameswaram towards Mukundarayar Chathiram which only recently I came to know from the Auto driver who took me to Kodandaramar Temple near Mukundarayar Chathiram. Through him I came to understand the remains of the Railway line was indeed a lost station called Rameswaram Road or Puthu Road. 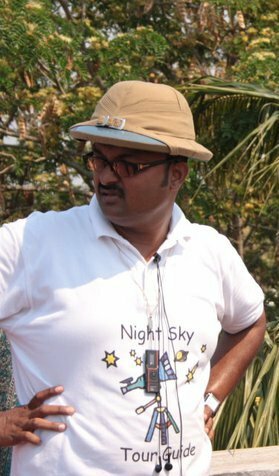 The detailed photographic account is given below and if I am joined by enthusiastic trek and adventure friendly rail fans, I intend to make a trip along the old rail alignment till this very lost station from Pamban Junction. This station was washed away on 26/12/1964. Now only a water tank's pedestal remains. This station served Rameswaram Town apart from the the town very own railway station. 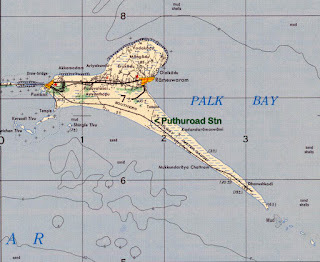 The Station was diagonal and it went to Pamban Junction. In 1990 the remains of the MG line was cleared and its alignment was converted into a two lane National Highway NH 55 (old NH49). This station served Rameswaram and located some 3 Kms from the Rameswaram Railway Station. On December 22nd at 23.55 hours while entering Dhanushkodi railway station the train no.653 Pamban Jn - Dhanushkodi Passenger which left Pamban Junction with 110 passengers and 5 railway staff was hit by the cyclonic storm and high tidal waves and the whole train got submerged under water killing all 115 on the spot. This line Terminated in Danushkodi pier from where two streamers connected it with Thalaimannar in Ceylon from where one can catch a connecting train to Colombo. Indo-Ceylon Express (Boat Mail) connected this place with Madras (Chennai).From Danushkodi S.S. Irwin was prime mover that connected the Thalaimannar. This is model of the ship, "S.S. Irwin" which was plying between Dhanushkodi and Talaimannar Pier. The ship was built in 1929 and put on service in the year 1930. The tonnage of the ship is 970.11 gross and 377.39 registered. The overall length and breadth are 259 feet and 38 feet respectively. Its passenger carrying capacity in fair and rough weather is 1552 and 1045 respectively. The normal speed of this is approximately 10 knots. The markings on this iron Sleeper or tie M&SMB is an abbreviation of material and systems management branch (m&s). Indicates this line and the station were built by British Indian Army. Wow, beautiful capture n wonderful narration. Photos took me over directly. Oh. It's a good narration. The lonely road and the hidden Rail lines! Bringing history back is always painful. Thanks for the article. The lost station is Dhanushkodi, not Rameswaram Road. 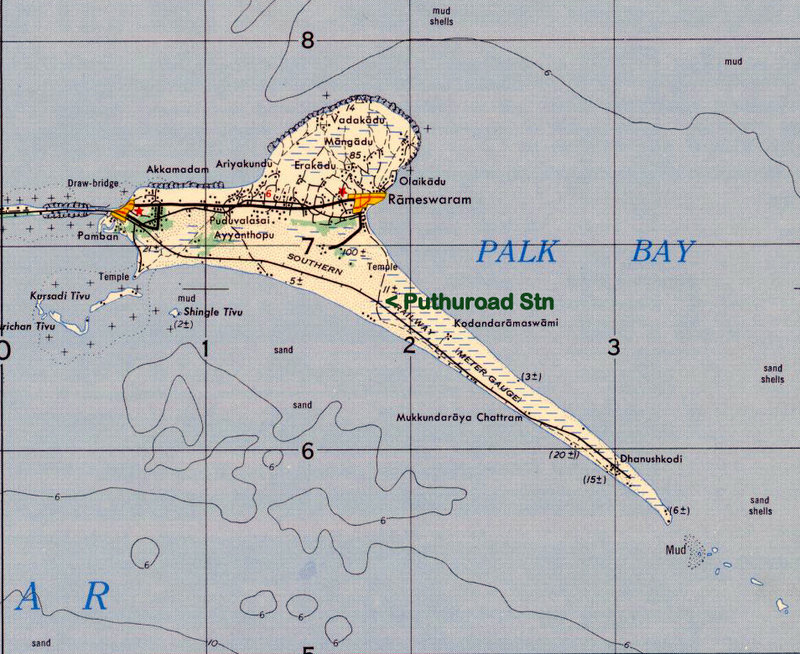 Pamban is and was never a railway junction. It is M&SMR, not B. Stands for Madras & Southern Marhatta Railway.